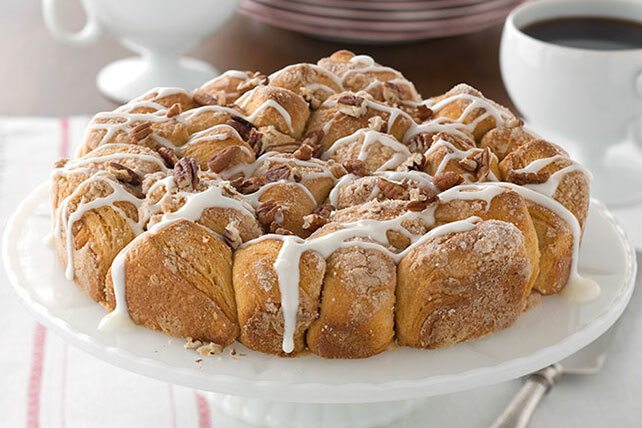 Drizzle this Pull-Apart Coffee Cake with glaze and top it with toasted pecans. Our Pull-Apart Coffee Cake looks like it came from a bakery, but wait until they find out you made it! Bake 20 min. Cool 5 min. Remove from pan to wire rack; cool 10 min. Microwave cream cheese spread in small microwaveable bowl on HIGH 15 sec. ; stir in sugar and milk. Drizzle over cake; sprinkle with nuts. Serve with a hot cup of brewed MAXWELL HOUSE Coffee. This simple coffee cake is equally delicious whether served warm or at room temperature.